Note: These plans consist of a booklet of 19 pages of text and many of Marya Butler's beautiful drawings (example below) on 8.5" x 11" pages. You have the option to choose either printed plans or an instant download PDF. To save $5 and postage costs choose the download option below. 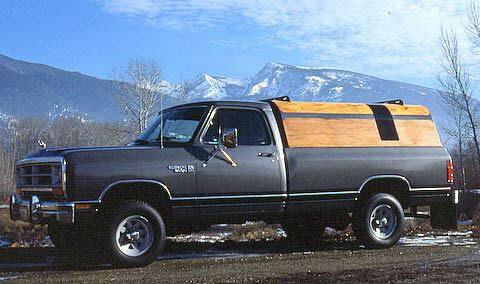 This truck topper was originally commissioned and published by Popular Science magazine in 1987. Designed as a lightweight topper, it has been built in a variety of sizes and shapes to fit various trucks from compact to standard size, short bed or long bed, and height can be adjusted to match the cab profile or slightly higher. The topper shown is built of hardwood ply, sealed with epoxy. Sheet ply is used for flat sections and large radius corners are formed by laminating multiple layers of thin plywood over sawn plywood curves. 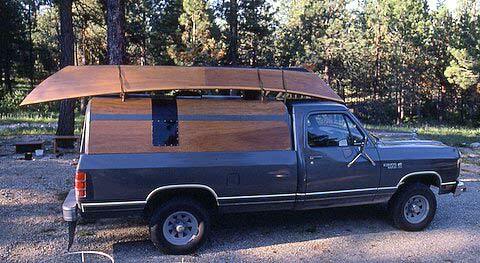 There are many options and the topper may be built lightweight or heavy-duty, using hardwood or softwood plywood. Extra long term protection can be provided by sheathing the topper with fiberglass cloth and using glass tape on corners. The topper may be finished natural or painted. Interior finish can be basic or fancy with insulation and fabric headliner. The overhead hatch can be large to allow standing access or omitted completely. Window and door placement is optional depending on intended usage and can be traditional RV sliding types or simple acrylic non-opening as shown. Doors may be single or double. 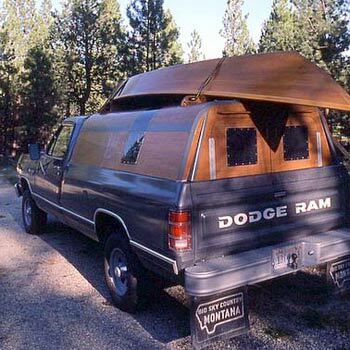 The topper has been a popular and successful project which led to the larger truck camper project published a few years later in Outdoor Life magazine. The topper sits on the edge of the truck bed and is attached with bolts or clamps. A camper is a complete modular unit with floor and is usually built higher and somewhat wider than the truck cab to provide more interior space. Plans encourage practical and safe modification and include blueprints and step-by-step instructions, all written for amateur builders.